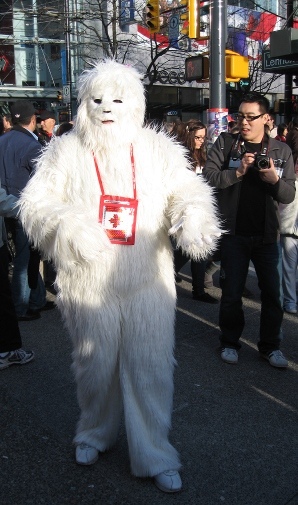 Those days in Vancouver red and white are fashionable. 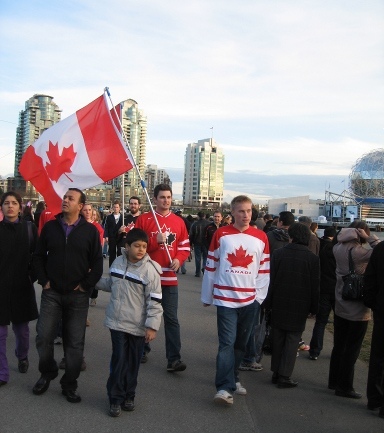 Indeed Canadians are patriotic and they are not embarrassed to wear their country’s colors. 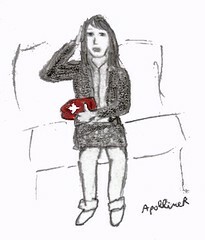 Fashionable women are satisfied with a small touch of red and white: they wear a scarf or the famous olympic mittens. 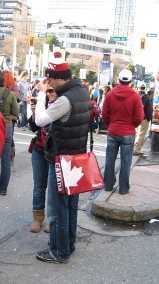 The official mittens are certainly the most popular Olympic collectibles. They are red with a maple leaf (symbol of Canada) on one side and the Olympic rings on the other side. There are a few supporters of other countries but most fans are here to support Canada. 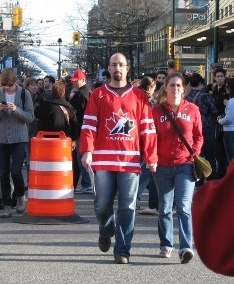 I have only taken pictures of few people but you must imagine nearly half the people on the street wearing red clothes. It is quite impressive.